A three days workshop was recently concluded at the St. Joseph’s Catholic Hospital by ISGlobal, to mark the close of an eighteen month project titled Strengthening Laboratory Capacities for Clinical Trials on infectious diseases or SELeCT for short. The research project which was sponsored by EDCTP, and WHO-TDR included training the hospital personnel on clinical trial conduct; upgrading the laboratory infrastructure and capacities to guarantee performance of basic analytical techniques, as well as correct handling and shipping of samples in an emergency context; and to implement practices for building community engagement in clinical trials. The SELeCT project which begun on February 1, 2016, is a consortium of ISGlobal, the St. Joseph’s Catholic Hospital of Monrovia and the Fundación Juan Ciudad NGO, and was one of six proposals selected by EDCTP for funding. During the project, the St. Joseph’s Catholic Hospital laboratory was upgraded, and a clinical Trial Unit consisting of five operative units, (Administration and development; Clinical research and pharmacy; Laboratory research; Data management; Community education and involvement) was established. 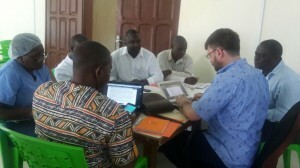 During the just ended workshop to mark the project closure, staffs of St. Joseph’s Catholic Hospital who participated in the project practiced writing articles or scientific papers on some of the core objectives of the project, including malaria prevalence, with results obtained during the project. It is believed that after the project, St. Joseph’s Catholic Hospital and ISGlobal will maintain long-term research relationship for future joint projects, building on the ample experience of ISGlobal in clinical research in fields such as maternal, child and reproductive health, malaria elimination and antibiotic resistance.